The ranges of the Mojave rattlesnake, also known as the Mohave green rattlesnake, and the western diamondback rattlesnake overlap in certain areas. If you hike out in this country, it wouldn't hurt to know which ones you stumble upon -- and it could save your life. The Mohave rattler and the western diamondback resemble each other, but certain distinguishing characteristics make identification fairly reliable for the amateur. While Crotalus scutulatus, the Mojave rattlesnake, looks a lot like the western diamondback rattlesnake, it usually has a greenish tinge that the other snake does not. That's probably the easiest way to tell the difference without getting dangerously close. The Mojave rattlesnake also boasts two or three large scales between the eyes, near the top of the head, which the western diamondback doesn't have. At maturity, this snake grows between 2 and 4 feet long. While Crotalus atrox, the western diamondback, is named for that telltale diamond pattern, the base coat varies according to habitat. It can range from from dark red to pinkish, yellow, beige, brown and gray. It has a white stripe that extends from the eye to the mouth, not characteristic of the Mojave rattlesnake. Larger than the Mojave rattlesnake, the western diamondback matures between 2 and 7 feet long. The diamonds on both of these species' backs are what make the two snakes look so much alike. Both snakes also have white and black rings on their tails. The white rings on the tail of the Mojave rattlesnake are wider than the black rings, and the dark diamond pattern fades as it reaches the tail. The western diamondback's rings are of equal width, and the diamond pattern fades less. As its name indicates, the Mojave rattlesnake lives in the desert. Its range extends from southern Nevada and the southwestern part of Utah, along to Puebla and Veracruz in Mexico, and the western California Mojave Desert to west Texas. The western diamondback's range extends into western Arkansas, much of Texas, eastern and south-central Oklahoma, southern and central Arizona, New Mexico, southernmost Nevada, southern California and into Mexico -- from the northeastern Baja California and Sinaloa in the west as far east as Veracruz, Querétaro and Hidalgo. 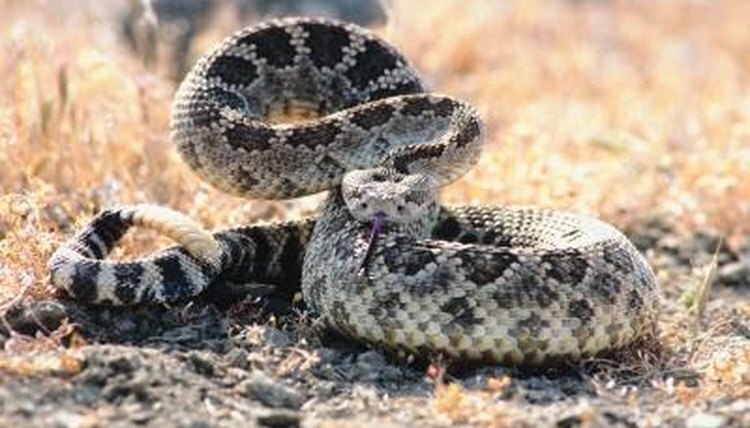 Although you don't want to get bitten by either rattlesnake, the venom of the Mojave is far more toxic than that of the western diamondback. You probably won't die if you get bitten by a western diamondback; but without swift medical attention, a Mojave rattlesnake could do you in. The Mojave is also more aggressive than the western diamondback. Always seek immediate attention if you've been bitten by a snake, even if you have no symptoms of poisoning.